A shower radio is very similar to your traditional radio. But it is designed to be water proof or resistant, hence it can be used in the bathroom and even near the pool. It often comes with a hook or suction cup so it can be installed in a bathroom. The shower radio can be a nice gift to people whom you know to like singing in the shower. It can also be good purchase for you if you are the type of person who likes to listen to morning newscast on the radio. For some people, the best shower radio can also keep them entertained while they do their business in the toilet. A shower radio can also let you receive or make calls while in the bathroom. Indeed, it can enable you to multitask in the morning as you prepare for a long day ahead. iFox iF012 Bluetooth Shower Speaker is a 100% waterproof shower speaker. It is even submersible. Its hard casing protects the speaker against water and other elements.It is also durable enough that it won’t miss a beat even if you drop it on the floor. iFox iF012 Bluetooth Shower Speaker has a 3watt output speaker that is good enough to give clear and audible audio. It weighs less than 2 ounces, thus it can be carried almost everywhere. This unit has a battery that can last up to 6 hours. Recharging the battery would take around 2-3 hours. This is a highly rated product, but the usual complaint about this unit is that its suction cup isn’t that strong. Many owners say it doesn’t stick that well. Conair SR10 Shower Radio is a more basic radio compared to the iFox iF012. It is water resistant, and has a convenient hang hook. You can hang this analog radio in the shower pipe, curtain rod, or even the soap dish.It makes use of four AAA batteries, with conveniently placed buttons and lever for start and volume control. Because of its very simple design and basic features, this shower radio doesn’t cost that much. For a very low price, you can get a water resistant shower radio. Its full volume is loud for such a cheap unit. And I also like that it has a small footprint, so it doesn’t take a lot of space in the bathroom. The manufacturer, however, could have added the AAA batteries in the product package. There are also durability concerns about this shower radio. Sangean H201 AM/FM, Weather Shower Radio is another basic AM/FM radio that you can bring inside the bathroom. It is a digital radio that lets you scan and store up to 10 stations.It is water resistant, with a large and easy to read LCD display. There’s a bracket and hanger to install this radio in your bathroom. I particularly liked its backlit LCD display. It shows the station you are tuned in, volume level, power level, timer setting, and current time. It is big enough to be seen from across the room. The unit is also pretty affordable, which makes this a good buy to the budget-conscious. The only real concern is that it isn’t as portable as the other shower radios in this list. Pyle Home PSR6 Waterproof Shower Clock Radio is another digital shower radio that also has a clock function. It has an integrated antenna that gives it the ability to pick up all local stations.It has a hanging hook for installation, with a rotary volume control. What I like about this shower radio is that it has a clock. You can keep track of the time you have been in the bathroom with this shower radio, which is important during those busy days. While it is lightweight at less than 3 ounces, it is a big bulky so this one isn’t the most portable in this list. Conair Home SR9 Pink Shower Radio is another basic analog AM/FM radio tuner that you can bring in your bathroom. It is water resistant, with a convenient hang hook.Its on/off button is easy to push, with a separate control for volume level. The unit uses 4 AAA batteries, which unfortunately aren’t included in the package. Reviews .com suggest that this is a unit with a very small footprint. It won’t take up a lot of space in your bathroom, which is what a shower radio should be. They also say that it is portable enough to be brought almost everywhere. Others are also in awe with the sound quality of the unit. They can’t believe it has a good sound quality despite being very cheap.But others aren’t impressed with the build quality. They say it won’t last long. This is a unit that is very similar to the item in number 3, but it has one main difference—it can receive all 7 NOAA weather channels which can alert you about weather emergencies and power outages. Sangean H202 AM/FM/Weather Shower Radio also has a siren that sounds off during extreme weather conditions like storms, so you can prepare even before these weather disturbances strike. Moreover, there are 20 preset stations that you can store on this shower radio. 10 of the preset stations are for FM stations, 5 for AM, and 5 for WX. There’s also a built-in timer that you can turn to in case you decide to place this in your bedroom. Another big difference of this digital tuner is that it has Bluetooth capability. So you can stream your favorite tracks on Spotify through this shower radio. This is a really good unit to get if you want a shower radio at home. The only downside is that you will have to pay more if you want this unit. Conair Home Teal Shower Radio is another reasonably priced shower radio that you might want to get if you like singing while taking a bath. It is water resistant and has a hang hook.It is powered by four AAA batteries. To switch on the unit, simply push the on-off button. There’s also a separate control for adjusting the volume level. Many of those who have bought this shower radio are satisfied with the unit. They say that potential buyers should not expect a technologically advanced radio because this unit is a basic, no-frills AM/FM tuner. But they argue that it does what it is supposed to do. One of the things I like about this shower radio is that its sound quality is good. We’re talking here of a very cheap AM/FM tuner so you may even think that the audio quality is sub-par. But I found its sound quality to be good enough. Many reviews .com suggest the same thing. Reviewers say that they can hear the radio clear enough when they are in the shower. Another common comment is that the dials are big and easy to turn. Reviewers say that the push button power switch is nice to the touch. The only thing that owners are disappointed is that this unit requires 4AAA batteries. It also doesn’t help that there are no batteries included in the package; so you’ll have to buy your own. Also Read: Best Shower Valve – Selections From A Pro! With its water resistant housing, this mini digital AM/FM radio can continue working even if it is exposed to water splashes.It also has a large digital display that shows the radio frequency and the time. Pyle PSR14 Mini Digital AM/FM Radio is a good device to have inside the bathroom, as you would be able to keep track of the time during those hectic mornings. There are also a lot of features you will find useful in this device. You can connect to your favorite mp3 tracks saved on your smartphone, iPod, mp3 player, or tablet with this tuner. Simply connect the media player on the unit’s 3.5mm output. It also has a convenient foldable handle that would let you hang it up wherever you want. But what is disturbing for some Amazon.com reviewers is that this unit has separate battery requirements for the clock and radio. For the clock, it needs a couple of AAA batteries. For the radio, you need to put 2 AA batteries. Moreover, there are no batteries included in the product package. Sony is without the doubt the most popular brand in this list. This unit from the popular brand is a throwback of sorts. Sony SRF-M37W Walkman Digital Tuning Radio is a Walkman digital tuner that you can use for listening to AM and FM stations.Its headphone cord doubles as the FM antenna. Moreover, it has a direct weather button that lets you receive your local weather forecast. Many reviewers .com like it because it is reasonably priced, even from a brand as widely known as Sony. But this may not be the best shower radio in this list because one, there’s no hook or suction cup in this item. You may have to find a stable area in your bathroom where you can place this FM/AM tuner. These are 10 well recommended shower radios that you would want to have in your bathroom. All these shower radios are water proof, and thus should work well despite being exposed to water for most of the time. These devices are also very user friendly and portable. You can bring them outdoors, too, because of their compact design. Another thing that you’ll love about these shower radios I handpicked is that the devices are pretty affordable. You won’t have to break the bank, so to speak, in order to acquire any of these radios.With the best shower radio in your bathroom, you can sing to your heart’s content every time you take a bath. Shower radios can be classified into the following types— analog, digital, and Bluetooth-enabled. The analog type of shower radio is very simple and easy to use. You scan for a radio station manually or by hand. It is also the cheapest type. On the other hand, the digital shower radio is more advanced than the analog type. Instead of the user manually looking for radio stations, the unit automatically scans and stores radio stations. There are also preset buttons thus you don’t have to manually look for a radio station every time you use it. Then there are the Bluetooth-capable devices which can connect to any media device with Bluetooth capability. As mentioned earlier, most shower radios today come with a suction cup so these units can be installed on a bathroom wall. Others have a hook so the unit can hang on a shower fixture. It is really up to you to decide which installation option is suited for your bathroom although suction cups are less desirable because it’s a hit-or-miss as far as adhering to the wall is concerned. Since you will be using the radio in the shower, it is thus important to get a shower radio that is waterproof. You don’t want the unit to get permanently damaged in case you drop it on a pail of water or on the hard floor. Do note that not all shower radios are water resistant or waterproof. Some are only splash proof, meaning that an inch of standing water will likely destroy them. Not all shower radios are created equal in terms of features. 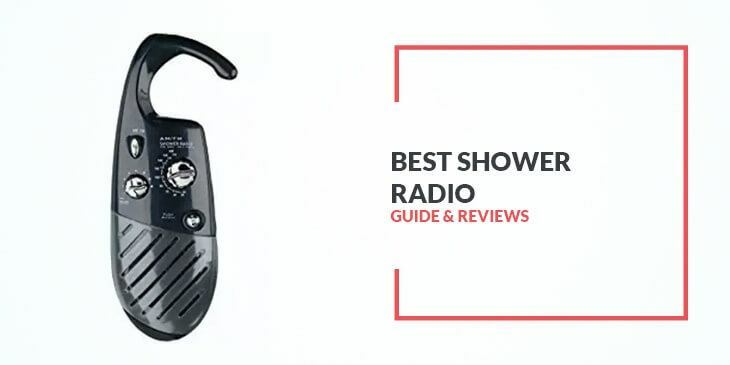 Most of the top rated shower radios are Bluetooth-capable, enabling their users to stream their favorite tracks via apps like Spotify. These Bluetooth-capable devices also allow users to make or receive phone calls even if they are inside the bathroom.